What sets one motherboard apart from another is not necessarily the manufacturer but the electronics used in the contruction of the item. These controlling electronics are the chipset. Originally most of the functions of the chipset were performed by multiple, smaller controller chips: controlling the cache, performing direct memory access (DMA), handling interrupts, transferring data over the I/O bus, etc. As technology has progressed these chips were integrated to form a single set of chips, or chipset, that implements the various control features on the motherboard. This mirrors the evolution of the microprocessor itself: at one time many of the features that are now incorporated into the CPU were on separate chips. The system chipset and controllers are the logic circuits that are the intelligence of the motherboard, controlling data transfers between the processor, cache, system buses, peripherals--basically everything inside the computer. Since data flow is such a critical issue in the operation and performance of so many parts of the computer, the chipset is one of the few components that have a truly major impact on your PC's quality, feature set, and speed. You can go about this two ways: Look at all the different chipsets and figure out which ones match your needs, or figure out your needs and see which chipsets best support them. Whichever method you use, keep in mind that the chipset dictates almost every function of your motherboard. Do you want an AGP graphics card? Are you planning to upgrade to an Ultra DMA100 hard drive eventually? Make sure your motherboard's chipset supports them. Windows NT/2000/XP users may want support for dual CPUs. A jumperless BIOS configuration is essential for overclockers. Other factors to consider are the number of expansion slots, type and maximum capacity of RAM, range of different CPUs supported, whether you can upgrade, and whether it will support the components and peripherals you plan to use with it. 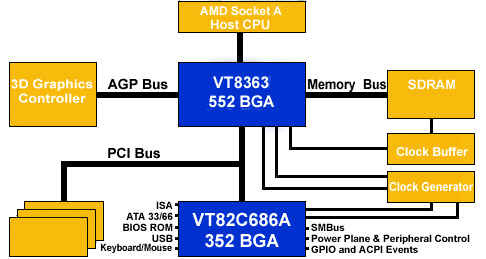 The Northbridge deals directly with the CPU and system memory via the Front Side Bus (FSB) and the Advanced Graphics Port (AGP) - if present. The Southbridge is connected over the Peripheral Interconnect Bus (PCI) and supports the IDE drives, USB ports, as well as the legacy buses and ports: ISA, serial, parallel.